The recent heavy snowfall and drifting brings one more thing that Rochester and Southeastern MN homeowners need to keep an eye on. Home owners with High Efficiency, direct vent furnaces and water heaters need to check to see that the venting has not been drifted over with snow or blocked. These systems typically vent through the sill plate of the home, close to ground level through a white PVC piping like in the photo above. 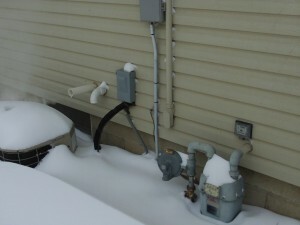 Drifting snow has the potential to block these vents, causing your furnace or water heater to not operate. These systems have sensors that will detect blockage which will shut down the system. This home inspectors recommendation is to go out and check to make sure these vents have adequate clearance after a heavy snow fall. If they are blocked, simply clear the snow out of and away from the vents, and you should be good to go. If there are still problems, call your local Rochester MN heating contractor to resolve the issue. I was discussing this with a client recently at a home inspection. The client’s Realtor spoke up and said that he learned this lesson last year. Cost him $75 to have someone come and clear the snow away from the venting.